APO can display stored information not only as a grid or list, but also as a calendar, a tree map, a tag map, a random map, a slide show of random items etc., complete with auto-tiling, drag and drop, and various kinds of animations. As an image viewer, APO has all you need to enjoy your digital images in various comfortable ways. It includes unique slide show features such as automatic script creation, session hibernation/resumption, photo editing on-the-fly etc. The image viewing functions of APO are also available as a separate program (see Pictoscope). With more than 20 different window forms, APO gives you in one product all the functions you may ask from a powerful, yet simple to use organizer for home and office use, plus capabilities you have never seen in any other product or even imagined. 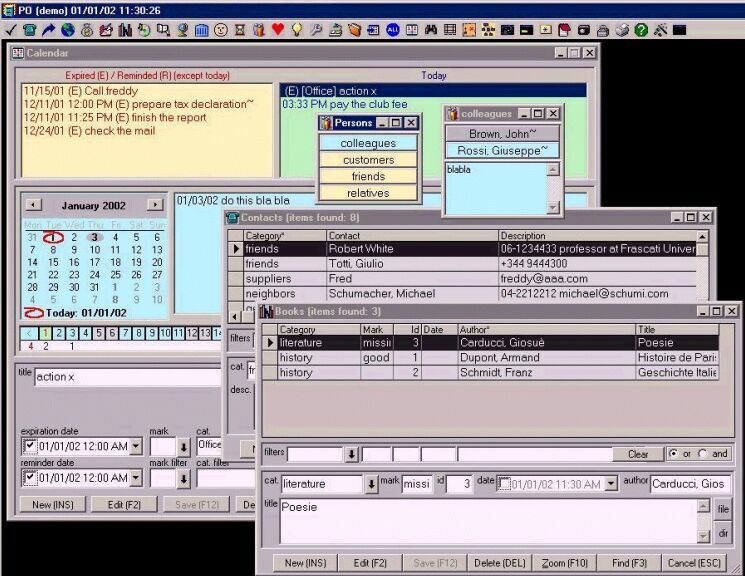 A simplified version of APO (without the image viewer and mind management functions) is available under the name A-PIM (All-in-1 Personal Information Manager). APO is compatible with all Windows versions. 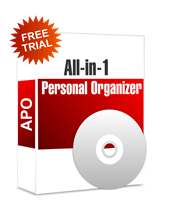 All-in-1 Personal Organizer (APO) can be used without registration for 30 days from installation.